Where Spring Festival firecrackers once crackled for days on end on the streets and across the cities of China, nowadays families celebrate the weeklong holiday period with movies, museum visits and travel, according to data released on Sunday. Casual tourism, movies, exhibitions and experiential activities showcasing folk culture are increasingly welcomed by the Chinese people, the latest government data showed. Chinese people made 415 million trips during the holidays, up 7.6 percent on last year, which brought a 513.9 billion yuan ($76.19 billion) profit to the Chinese tourism industry, the Ministry of Culture and Tourism said. The Ministry of Commerce released a report late Sunday which drew the same conclusion. The Forbidden City, for example, has become a more popular destination for ordinary Chinese to celebrate the festival, where people can gain an insight into how the emperors spent their holiday. The Forbidden City was fully booked after Chinese New Year's Eve with all 80,000 tickets sold out every day, and about 500,000 tickets have been sold during the whole festival, according to the data released by the Ministry of Commerce. 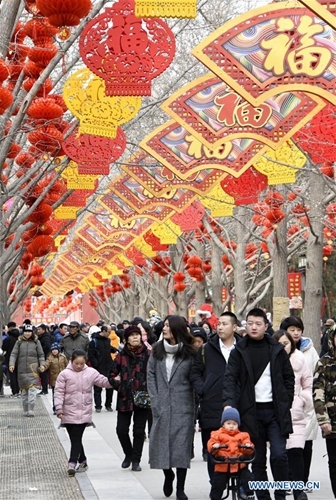 Temple fairs at Beijing's Ditan and Longtan parks together received more than 1.41 million visits in five days from the first day of the Chinese Lunar New Year, the Beijing Daily reported on Sunday. Lantern shows across China, including in Shanghai, Shaanxi Province's Xi'an and Guizhou Province's Guiyang also attracted crowds. Lu Ming, a resident of Zigong, Sichuan Province's third largest city, known for its lantern show, told the Global Times that Caideng Park was "always hopping" during the festival, even though the ticket price was raised to 130 yuan from 50 yuan. Police had to restrict traffic in the area because of the crowds, Lu said. Li Qiuyan, public relations chief of the travel agency Lvmama, told the Global Times on Sunday that growing Spring Festival tourism reflected a popular pursuit of "spiritual and folk cultures." Scenic spots such as the Forbidden City stress a fusion of tradition and modernity, providing a more experiential and immersive experience, Li said. Chinese people welcomed domestic movies released during the Spring Festival including Crazy Alien, Pegasus and the Chinese mainland's first blockbuster sci-fi film The Wandering Earth. The total box office for all movies in China during the festival reached 5 billion yuan, the Ministry of Commerce said on Sunday. The Wandering Earth topped the box office, taking in more than 1.68 billion yuan six days after its release as of Sunday, Sina Entertainment reported. A sci-fi film offers us a fresh taste, Liu Longxiang, a 24-year-old Hebei Province moviegoer, told the Global Times. Liu took 10 family members to see the surprise hit post-apocalyptic disaster flick on the second day of the Spring Festival. With Sunday the last official holiday day of the Spring Festival, China experienced a travel surge on Saturday that is expected to last till Thursday. More than 582,000 people are expected to arrive at the three railway stations in Beijing on Sunday, Beijing News reported, citing the Beijing Railway Administration. Railway stations in Guangdong Province have been estimated to expect more than 1.7 million travelers on Sunday, Guangzhou Daily reported. The State Council, China's Cabinet, previously predicted that the 40-day Spring Festival travel rush from January 21 to March 1 will see 2.99 billion trips. No newer official data had been released as of press time. According to the data released by the National Immigration Administration on Sunday, more than 7.22 million entry and exit trips were made during the holiday by Chinese mainland citizens, a 15.97 percent year-on-year growth, with the majority going to Thailand, Japan, Vietnam and South Korea. The US is also one of the top 10 outbound tourism destinations for Chinese families during Spring Festival. Many visited museums as well as the more traditional scenic destinations, the Xinhua News Agency reported.